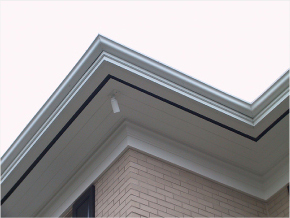 Primeau offers an extensive choice of eavestroughs and accessories that meet a wide range of specific needs and tastes. However, we are able to accommodate an even wider range of requests. Using highly sophisticated machinery, we are able to freely shape steel, copper and other hard metals and create exactly what you need and what best fits your property. And since Primeau trains its own personnel, we have the capacity to provide the installation of all the customized eavestroughs our customers demand and ensure that after-sales services provide total satisfaction. Choose from Galvalume® steel, aluminum or copper; Hi-Bak® or J-Style® eavestroughs; leaf screens; Primair® soffits and fascias. We have the best products on the market, also available in a wide range of colours. We’ll provide you with a free estimation, quality advice, professional and rapid installation, quality products, and a reputable warranty policy. With 60 years in the business, Primeau Métal Inc. has earned the trust and loyalty of its clients and continuously strives to perfect its products and services. The Primeau products are subject to quality control for maximum durability and aesthetic appeal. Both consumers and professionals prefer our products, as their quality exceeds industry standards and always meets the highest expectations. Hi-Bak® products have been designed and manufactured with the Canadian homeowner in mind. 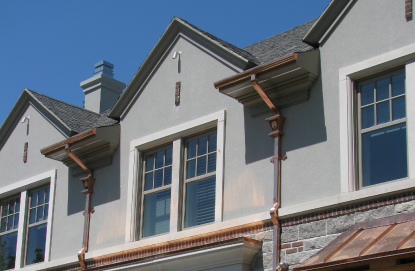 Hi-Bak® is our signature product, demonstrating over 60 years of accumulated knowledge & experience in tinsmithing, rain gutters, & related accessories.